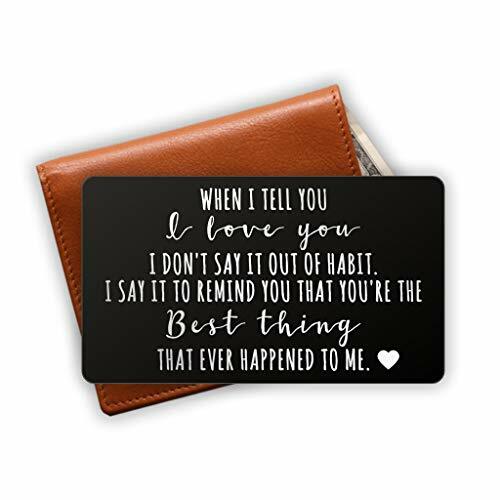 PERFECT GIFT FOR YOUR HIM - This wallet insert is a sentimental gift for someone you love. Let them carry your love everywhere they go. Perfect for Husband Gifts, Boyfriend Gifts, Anniversary Gifts, Deployment Gifts, Dating Gifts, Wedding Gift, Halloween, Thanksgiving Day, Valentine's Day, Christmas, Wedding Gifts and more. PERFECTLY IN WALLET & DURABLE - Credit Card size: 3.5" x 2"x 0.02" (85mmx 55mmx0.5mm). Material is stainless steel that is durable. Thin 0.2in but strong. Won't bend in wallet. PERMANENT ETCHING ON BOTH SIDES - It will not fade or wear off!. FAST SHIPPING via Amazon Prime! Package contain only personalized Metal Wallet Love Note Card. Wallet is not Included. If you have any questions about this product by PinMaze, contact us by completing and submitting the form below. If you are looking for a specif part number, please include it with your message.